Glioblastoma multiforme is a deadly cancer for which current treatment options are limited. The ability of glioblastoma tumor cells to infiltrate the surrounding brain parenchyma critically limits the effectiveness of current treatments. We investigated how microglia, the resident macrophages of the brain, stimulate glioblastoma cell invasion. We first examined the ability of normal microglia from C57Bl/6J mice to stimulate GL261 glioblastoma cell invasion in vitro. We found that microglia stimulate the invasion of GL261 glioblastoma cells by approximately eightfold in an in vitro invasion assay. Pharmacological inhibition of epidermal growth factor receptor (EGFR) strongly inhibited microglia-stimulated invasion. Furthermore, blockade of colony stimulating factor 1 receptor (CSF-1R) signaling using ribonucleic acid (RNA) interference or pharmacological inhibitors completely inhibited microglial enhancement of glioblastoma invasion. GL261 cells were found to constitutively secrete CSF-1, the levels of which were unaffected by epidermal growth factor (EGF) stimulation, EGFR inhibition or coculture with microglia. 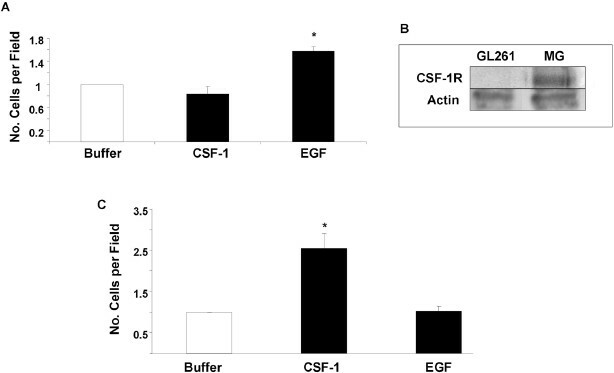 CSF-1 only stimulated microglia invasion, whereas EGF only stimulated glioblastoma cell migration, demonstrating a synergistic interaction between these two cell types. Finally, using PLX3397 (a CSF-1R inhibitor that can cross the blood-brain barrier) in live animals, we discovered that blockade of CSF-1R signaling in vivo reduced the number of tumor-associated microglia and glioblastoma invasion. These data indicate that glioblastoma and microglia interactions mediated by EGF and CSF-1 can enhance glioblastoma invasion and demonstrate the possibility of inhibiting glioblastoma invasion by targeting glioblastoma-associated microglia via inhibition of the CSF-1R. Supplementary material is available for this article at 10.2119/molmed.2011.00217 and is accessible for authorized users. Glioblastoma multiforme (grade IV) remains one of the most difficult cancers to treat, with a median survival rate of 12 months after diagnosis (1,2). This result is primarily because high-grade glioblastomas are highly locally invasive and, as a result, a relatively large population of invading cells is left behind after surgical resection (3). Therefore, targeting the motile properties of this tumor is an attractive strategy for therapeutic intervention. Although progress has been made in elucidating the genetic alterations and oncogenic signaling pathways responsible for glioblastoma, the molecular mechanisms of glioblastoma cell invasion are still largely undefined. It is becoming increasingly clear in the field of cancer biology that the tumor microenvironment, which includes stromal cells such as fibroblasts and cells of the immune system, plays a critical role in disease progression (4). Tumor-associated macrophages are an important class of cells in the microenvironment that can potentiate carcinoma cell invasion and metastasis (5, 6, 7, 8). There is emerging evidence that the resident macrophages of the central nervous system, microglia, may play a similar role in aiding glioblastoma progression. Glioblastoma tumors contain substantial numbers of microglia and/or macrophages, especially at the invasive border (9). Brain slices cultured ex vivo and depleted of microglia using clodronate liposomes are refractory to glioblastoma cell invasion (10,11). Microglial-secreted transforming growth factor (TGF)-β can act as a chemoattractant for glioblastoma cells in in vitro invasion assays (12). Importantly, recent studies have reported that in vivo ablation of microglia results in a significant reduction in glioblastoma tumor size (13,14). Interestingly, there also is genetic evidence that microglia promote the growth of optic glioma in Nf1+/− mice (15). However, the glioblastoma-produced factors that influence microglial behavior remain undefined. In this study, we demonstrate a role for epidermal growth factor receptor (EGFR) and colony stimulating factor 1 receptor (CSF-1R) signaling during microglia-stimulated glioblastoma invasion. The cells used in this study were GL261 murine glioblastomas (obtained from the National Cancer Institute, Frederick, MD, USA), U251 human glioblastomas (American Tissue Culture Collection, Manassas, VA, USA) and normal murine microglia originally isolated from C57Bl/6J mice, as previously described by Dobrenis (16). Primary microglia cultures were generated from high-density mixed cell-type cultures of neonatal neocortex by differential adhesion methods producing highly purified (>99%) microglial populations, as assessed by cell-type specific markers including F4/80 (13). To further maximize and ensure purity for experiments, the isolated cells were subcultured an additional three times with stringent selective adhesion on nontissue culture-treated “suspension cell” plates (Sarstedt) to further limit nonmicroglial cells. All cultures were maintained in Macrophage-SFM (MSFM; Life Technologies Corporation, Grand Island, NY, USA) with 10% fetal calf serum. Microglia were supplemented with 10 ng/mL recombinant mouse granulocyte macrophage-colony-stimulating factor (GM-CSF) (R&D Systems, Minneapolis, MN, USA). All cells were cultured in a humidified incubator containing 5% CO2 at 37°C. Recombinant human colony stimulating factor 1 (CSF-1) was a gift from Chiron Corporation. Iressa was obtained from AstraZeneca. A novel CSF-1R receptor inhibitor, 4-cyano-1H-pyrrole-2-carboxylic acid [4-(4-methyl-piperazin-1-yl)-2-(4-methyl-piperidin-1-yl)-phenyl]-amide (hereafter referred to as “JnJ”), provided by Johnson & Johnson Pharmaceutical Research & Development (Johnson & Johnson, New Brunswick, NJ, USA), was used at 10 nmol/L (17). Two additional novel CSF-1R inhibitors, PLX3397 and PLX5622, were provided by Plexxikon. Small interfering RNA (siRNA) si-GENOME duplexes targeting mouse CSF-1R were acquired from Dharmacon, and microglia were transfected with 2 µL Dharmafect Reagent #1 with 20 nmol/L si-GENOME siRNA against murine CSF-1R (Dharmacon/Thermoscientific). Microglia were seeded 24 h before transfection in a six-well plate at 70% confluency. The siRNA and Dharmafect mixture was added to 1.6 mL complete microglia growth media (MSFM) with 10% fetal bovine serum and 10 ng/mL GM-CSF) and added to the cells. Cells were incubated with transfection mix for 72 h before the experiment. GL261 and microglial (MG) cells were stained with cell tracker green (5-chloromethylfluorescein diacetate (green) [CMFDA]) and with cell tracker red (CMTPX; Invitrogen), respectively, and then cocultured on Matrigel-coated invasion chambers (BD, Franklin Lakes, NJ, USA). For most assays, to maintain constant cell numbers, cells were plated at a density per invasion chamber of 100,000 labeled GL261 cells with an additional 100,000 unlabeled GL261 cells or with 50,000 unlabeled GL261 and 50,000 MG cells in MSFM with 0.3% bovine serum albumin (BSA) supplemented with 10 ng/mL GM-CSF. Invasion chambers were incubated for 48 h, after which they were fixed in 3.7% paraformaldehyde in phosphate-buffered saline (PBS). Imaging of the cells on the bottom of the filter was performed with a Bio-Rad Radiance 2000 Confocal microscope. The extent of invasion was quantified by counting the number of glioblastoma cells (green) that were on the underside of the filter in at least seven 20x fields. GL261 cells were plated on 8-µm pore transwells (Costar) that were lightly precoated with approximately 100 ng/mL Matrigel for 2 h at room temperature. GL261 cells were plated at a density of 100,000 cells in a 100-µL volume of MSFM with 0.3% BSA on the top of the chamber, whereas the bottom contained media alone, 10 nmol/L epidermal growth factor (EGF) or 50 ng/mL CSF-1 and was incubated for 4 h. Transwells were then fixed in 3.7% paraformaldehyde and stained with 0.2% crystal violet. The extent of chemotaxis was quantified by counting the number of cells on the underside of the filter. Conditioned media were collected from GL261 cells alone, stimulated with 10 nmol/L EGF or cocultured with microglia overnight in MSFM + 0.3% BSA and 10 ng/mL GM-CSF. Supernatants were harvested, centrifuged at 144g to remove any cellular material and then subjected to enzyme-linked immunosorbent assay (ELISA) for mouse CSF-1 (MMC00) performed according to the Quantikine protocol (R&D Systems). Cell cultures of microglia starved overnight in MSFM 0.3% BSA and microglia stimulated with CSF-1 in the presence of various inhibitors were lysed directly into 1x sample buffer (2% sodium dodecyl sulfate [SDS], 10% glycerol, 62.5 mmol/L Tris) containing β-mercaptoethanol and loaded onto 10% SDS-polyacrylamide gel electrophoresis (PAGE) gels. The proteins were resolved and transferred to a polyvinylidene fluoride (PVDF) membrane and blotted using an anti-phospho CSF-1R Y723 (#3155; Cell Signaling Technology) or anti-phospho ERK antibody (#9101; Cell Signaling Technology), followed by secondary blot using goat anti-rabbit antibody conjugated to IR800 in Licor Blocking Buffer (Licor). For detecting EGF, blotting was carried out using anti-EGF (sc-1342; Santa Cruz Biotechnology, Santa Cruz, CA, USA) at a concentration of 1:100 followed by secondary donkey anti-goat antibody conjugated to IR800 (Licor). For detecting CSF-1R, blotting was carried out using a rabbit antibody that recognizes the C-terminus of the CSF-1R (C-15 ). Blots were scanned on the Odyssey system. Blots were stained with anti-total ERK (#137F5; Cell Signaling Technology) and actin (A5441; Sigma-Aldrich) for loading control. Microglia were plated on glass-bottomed MatTek dishes and cultured in MSFM supplemented with GM-CSF for 48 h. Cells were then fixed in 3.7% paraformaldehyde in PBS for 15 min and blocked with 5% fetal calf serum in PBS for 1 h. Primary antibody staining was carried out by using either control goat IgG or anti-EGF (M-20) (Santa Cruz Biotechnology; sc-1342) at a concentration of 4 µg/mL overnight at 4°C. After washing with PBS, cells were stained with secondary anti-goat antibody conjugated to Cy3. Images were acquired by use of a Bio-Rad Radiance 2000 Confocal microscope. The effect of the inhibitors on proliferation/survival was assessed by use of sulforhodamine B (SRB) proliferation assays as described by Skehan et al. (19). GL261 cells (20,000) and microglia (10,000) were plated on 96-well plates and fixed by using 10% trichloroacetic acid (Sigma Aldrich) after incubation with dimethyl sulfoxide (DMSO), 5 µmol/L Iressa or 10 nmol/L JnJ for 48 h. After fixation, 0.2% SRB reagent in 1% acetic acid was used to stain the cells and was solubilized with 10 mmol/L unbuffered Tris base solution for 30 min. The absorbance was measured at 490 nm. All procedures involving mice were conducted in accordance with the National Institutes of Health regulations concerning the use and care of experimental animals. The study of mice was approved by the Albert Einstein College of Medicine Animal Use Committee. For intracranial injection, C57BL/6J mice (10–12 wks old; Jackson) were anesthetized with isofluorane. A hole was made 1 mm lateral and 2 mm anterior from the intersection of the coronal and sagittal sutures (bregma). The 2 × 104 GL261 cells were injected using a Hamilton syringe series 7000 at a depth of approximately 1 mm in a volume of 0.2 µL in the cortex. Mice were allowed to recover 24 h after injection and then fed either control chow or chow containing PLX3397 (Research Diets). Two weeks after injection, animals were killed and their brains were fixed in formalin for 72 h, paraffin embedded and sectioned. Microglia were visualized by immuno-histochemistry with an Iba1 antibody (Wako; #019-19741). Invasion was measured by counting the number of tumor cells, visualized with anti-Ki67 antibody (Vector; #VP-R451), that were found outside the tumor border. The total number of cells found outside of the tumor border in each field was counted and normalized to the total length of the border (in mm) for that field. Fluorescent probes directed against murine CSF-1 were obtained from Stellaris (Novato, CA, USA), and the procedure was carried out according to the manufacturer’s protocol. Briefly, paraffin-embedded sections containing GL261 tumor were deparaffinized, rehydrated in PBS and incubated overnight in formamide, 2× sodium chloride-sodium citrate and 2.5 µmol/L CSF-1 probe at 37°C. Samples were then washed, stained with DAPI for 10 min, sealed with a cover slip in mounting medium (1% n-propyl gal-late, 100 mmol/L Tris, pH 8.0, and 50% glycerol) and visualized by use of a confocal fluorescence microscope. We first established a microglia-glioblastoma coculture assay that allows quantification of microglia-stimulated cell invasion. As described in Materials and Methods, GL261 glioblastoma cells and microglia were stained with fluorescent green (CMFDA) and fluorescent red (CMTPX) dyes, respectively. Cells were plated on Matrigel-coated invasion chambers at a ratio of 3:1 glioblastoma to microglia cells (similar proportions to what is often observed in glioblastoma tumors) and incubated for 48 h. The extent of glioblastoma cell invasion was determined by confocal imaging and counting the glioblastoma cells (stained green), which had migrated to the bottom surface of the filter (Figures 1A, B). Coculture with microglia enhanced the invasion of GL261 cells on average by eightfold (Figures 1B, C). Coculture of microglia with the human GBM cell line U251 also resulted in an enhancement of invasion (Figure 1D). Microglia enhance GL261 glioblastoma cell invasion. (A) Schematic of glioblastoma-microglia coculture invasion assay. GL261 cells and microglia are stained, combined and plated on Matrigel-coated chambers, followed by incubation for 48 h and then evaluation of the number of cells that have crossed the filter. (B) Representative images of invading cells with 100,000 green-labeled GL261 cells cocultured with an additional unlabeled 100,000 GL261 cells (left) or with 50,000 red-labeled microglia and 50,000 unlabeled GL261 (right). Scale bar = 50 µm. (C) Quantitation of invasion by use of 100,000 green-labeled GL261 cells cocultured with an additional unlabeled 100,000 GL261 cells (open bar) or with 50,000 red-labeled microglia and 50,000 unlabeled GL261 (closed bar). Means ± stand error of the mean (SEM) of data from six independent experiments. *P < 0.001. (D) Invasion of labeled U251 (100),000 per chamber) cells plated with an equal number of either additional unlabeled (open bar) or with red-labeled microglia (closed bar). Means ± SEM of data from four independent experiments. **P < 0.05 control (+U251) versus +MG. Work from our laboratory and collaborators has shown that a paracrine loop exists between breast carcinoma cells and tumor-associated macrophages that involves EGF and CSF-1 (or M-CSF) (7). Blockade of either EGF/EGF receptor (EGFR) or CSF-1/CSF-1 receptor (CSF-1R) signaling was sufficient to block macrophage-mediated breast carcinoma cell invasion both in vitro and in vivo (7,8). We therefore investigated the role of EGFR and CSF-1R in mediating the stimulatory effect of microglia-stimulated glioblastoma invasion. To examine the role of EGFR in microglia-stimulated glioblastoma invasion, we used the EGFR-specific tyrosine kinase inhibitor Iressa. Addition of Iressa (5 µmol/L) significantly reduced microglia-stimulated glioblastoma invasion (Figure 2A). There was no inhibitory effect of Iressa on basal GL261 invasion (not shown), which indicates that the EGFR pathway is involved in mediating microglial stimulation of glioblastoma invasion and not autocrine signaling. Importantly, as shown by SRB staining, this concentration of Iressa did not have any effect on the proliferation of either cell type cultured in the same conditions used in the invasion assay (Figures 2B, C). This demonstrates that the effect of Iressa seen on glioblastoma invasion was specific to invasion pathways and not a result of a decrease in cell proliferation or an increase in apoptosis. 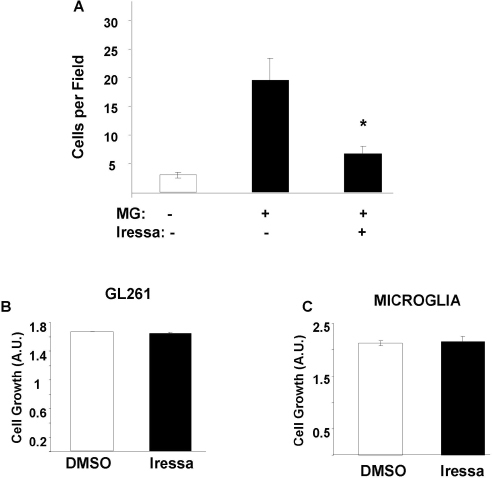 Iressa blocks microglia-stimulated glioblastoma invasion but not growth. (A) Invasion of GL261 cells plated with additional GL261 (open bar), microglia (closed bar; + MG) or microglia in the presence of 5 µmol/L Iressa (closed bar; + MG, Iressa). Means ± SEM of three independent experiments. *P < 0.05 + MG versus + MG Iressa. (B, C) SRB assay showing growth of either GL261 (B) or microglia (C) cultured under invasion assay conditions in DMSO (open bars) or 5 µmol/L Iressa (closed bars). Results are normalized to the day of drug addition. Means ± SEM from three independent experiments. A.U., arbitrary units. To test the involvement of the CSF-1R, we used CSF-1R kinase domain ATP binding site inhibitors provided by Johnson & Johnson (17) and Plexxikon (PLX3397 and PLX5562). 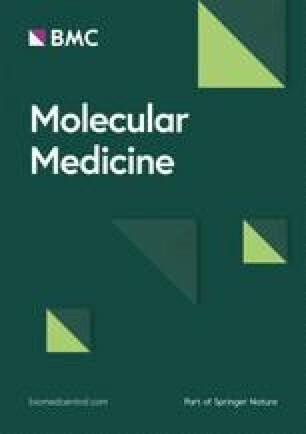 We first determined the concentration of these inhibitors needed to achieve complete inhibition of CSF-1R signaling by measuring their ability to block CSF-1 induction of CSF-1R phosphorylation and activation of the mitogen-activated protein kinase/extracellular signal-related kinase pathway. Microglia were treated with JnJ, PLX3397 or PLX5622 for 1 h before a 5-min stimulation with recombinant human CSF-1 (100 ng/mL). 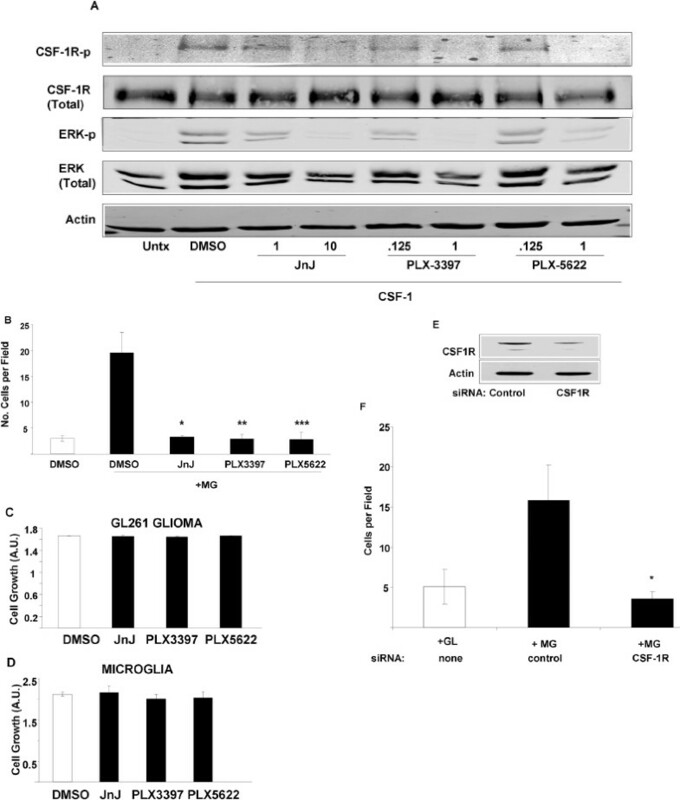 Western blotting of extracts harvested from these cells showed that there was minimal CSF-1R-Y723 or ERK phosphorylation in starved cells, whereas there was an appreciable signal after 5 min of CSF-1 treatment (Figure 3A). The JnJ CSF-1R inhibitor at 10 nmol/L was sufficient to nearly completely inhibit CSF-1-stimulated CSF-1R and ERK phosphorylation (see Figure 3A). The Plexxikon inhibitors were each effective at 1 µmol/L, but not when used at eightfold lower concentrations (see Figure 3A). 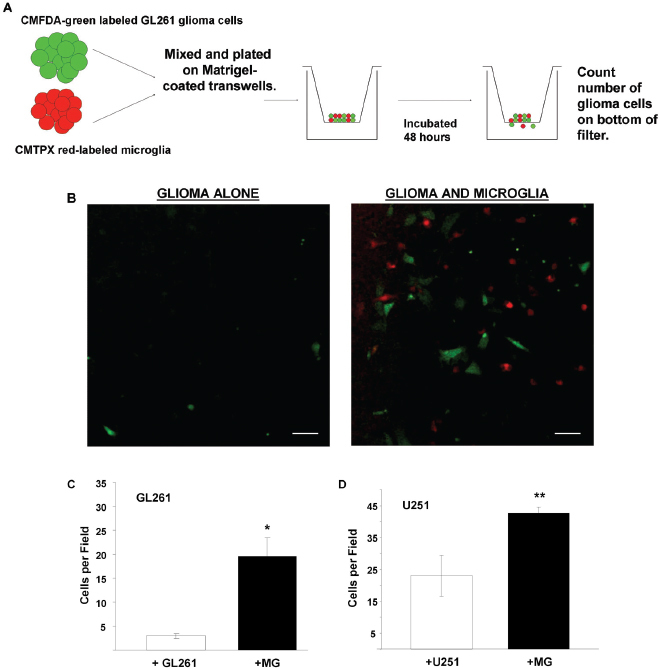 Microglial stimulation of glioma invasion depends on CSF-1R signaling. (A) Western blot showing the effect of the indicated concentrations of CSF-1R inhibitor on CSF-1-stimulated CSF-1R (Y723) and ERK phosphorylation levels. Result is representative of three independent experiments. (B) Invasion of GL261 cells alone (open bar) or with microglia (closed bars) in the presence of DMSO, 10 nmol/L JnJ, 1 µmol/L PLX3397 or 1 µmol/L PLX5622. Means ± SEM of data from six independent experiments. *P < 0.01 compared with +MG control. (C, D) Growth of either GL261 (C) or microglia (D) cultured under invasion assay conditions in DMSO, 10 nmol/L JnJ, 1 µmol/L PLX3397 or 1 µmol/L PLX5622. Results are normalized to the SRB measurement of cells on the day of drug addition. Means ± SEM of data from three independent experiments. (E) Western blot showing the extent of CSF-1R knockdown by siRNA. Blot shown is representative of three experiments. (F) Invasion of GL261 cells alone (open bar) or with microglia (closed bars) transfected with control siRNA or siRNA targeting CSF-1R. Means ± SEM of data from four experiments. *P < 0.05 compared with +MG control siRNA. Using the concentrations of CSF-1R inhibitors that were effective at inhibiting CSF-1-induced CSF-1R and ERK phosphorylation, we next tested their effects on microglia-stimulated glioma invasion. A total of 10 nmol/L JnJ or 1 µmol/L of either PLX compound completely blocked microglia-stimulated glioma invasion (Figure 3B). Basal GL261 invasion was unaffected by any of the inhibitors (data not shown). None of these inhibitors at the concentrations used in the invasion assay had any influence on proliferation rate or survival of either cell type under the duration time of these experiments (Figures 3C, D). As a complementary approach to pharmacological inhibition, we examined the role of CSF-1R by RNA interference. We delivered siRNA duplexes that target CSF-1R by transient transfection into microglia. We achieved at least 50% knockdown of CSF-1R at the protein level (Figure 3E). When cocultured with GL261 cells, CSF-1R-depleted microglia were unable to stimulate glioblastoma invasion (Figure 3F). These data demonstrate that the activity of the CSF-1R receptor in microglia is necessary for microglial stimulation of glioma invasion. Given the importance of CSF-1R signaling in microglial enhancement of invasion, we evaluated the expression of CSF-1 by ELISA. GL261 cells produced significant amounts of CSF-1 (>5,000 pg/mL CSF-1 in the conditioned media from a confluent monolayer of GL261 cells; Figure 4A), whereas microglia did not produce any detectable CSF-1 (data not shown). This result is consistent with an interaction in which the glioblastoma cells can stimulate microglia through CSF-1 activation of the CSF-1R on microglia. It was previously observed that stimulation of MTLn3 rat breast carcinoma cells by EGF results in an increase in CSF-1 mRNA (7). However, neither overnight stimulation of GL261 cells using 10 nmol/L EGF nor coculture with microglia produced an increase in CSF-1 production by GL261 cells (see Figure 4A). Furthermore, addition of Iressa to GL261 cells also had no effect on CSF-1 production, indicating that basal EGFR signaling in GL261 cells is not responsible for this high constitutive CSF-1 secretion (see Figure 4A). These results demonstrate that in GL261 glioblastoma cells, CSF-1 levels are not influenced by the EGFR pathway. We next determined if microglia express ligands for EGFR. Using an ELISA specific for murine EGF, we were unable to detect EGF in the supernatants harvested from either microglia or microglia cocultured with GL261 cells (data not shown). 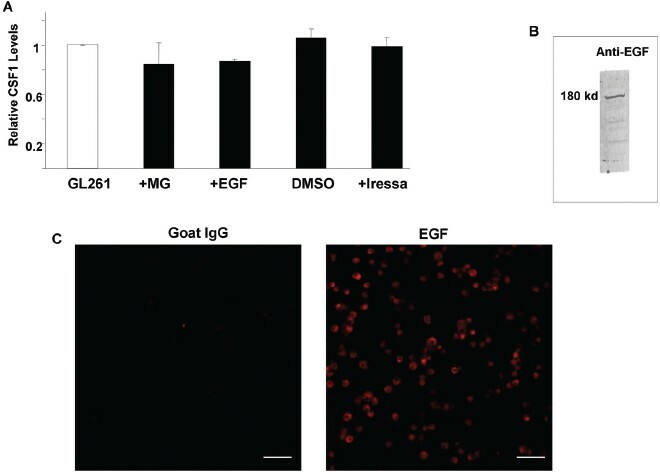 However, immunoblotting of microglial cell lysates with an anti-EGF antibody showed that they express the 180-kDa precursor for EGF (Figure 4B). Furthermore, we detected the expression of EGF in immunofluorescence assays by staining unpermeabilized microglia, suggesting that EGF is primarily associated with the plasma membrane in these cells (Figure 4C). Glioblastoma and microglia cells express CSF-1R and EGFR ligands. (A) Relative CSF-1 concentrations in supernatants from GL261 cells cultured in serum-free media with 0.3% BSA alone (open bar) or with microglia (closed bar; MG), 10 nmol/L EGF (closed bar; EGF), DMSO or 1 µmol/L Iressa overnight were determined by ELISA. Results are normalized to GL261 alone and are the means ± SEM of three independent experiments. (B) Western blot of microglia extracts using an anti-EGF antibody. Blot is representative of four experiments. (C) Immunofluorescence of paraformaldehyde-fixed microglia using an anti-EGF antibody. Image is representative of four independent experiments. Scale bar = 50 µm. A.U., arbitrary units. We confirmed that GL261 glioblastoma cells and microglia were responding to EGF and CSF-1, respectively. In the absence of microglia, GL261 cell migration was increased by a gradient of EGF but not CSF-1 (Figure 5A). Consistent with this result, a Western blot of lysates from GL261 and microglia showed that only microglia express CSF-1R (Figure 5B). Conversely, in the absence of GL261 cells, microglia invaded Matrigel-coated chambers in response to a gradient of CSF-1 but not EGF (Figure 5C). The selective and complementary response of microglia and GL261 cells to CSF-1 and EGF, respectively, supports an interaction between the cells mediated by EGFR signaling in tumor cells and CSF-1R signaling in microglia as being important for microglial enhancement of glioblastoma invasion. Glioblastoma and microglia respond to EGF and CSF-1, respectively. (A) Glioblastoma cells respond to EGF but not CSF-1R. GL261 cells (100,000) were plated on transwell chambers lightly coated with Matrigel, and migration in response to buffer (open bar), 50 ng/mL CSF-1 (closed bar; +CSF1), or 10 nmol/L EGF (closed bar; +EGF) in the bottom well was measured. Transwells were fixed and stained with crystal violet, and the extent of migration relative to buffer was determined by counting the cells on the underside of the filter. Means ± SEM of data from three experiments. *P < 0.01 compared with buffer control. (B) Western blot of GL261 and microglia extracts using an anti-CSF-1R antibody. Blot is representative of three experiments. (C) Microglia are induced to invade by CSF-1 but not EGF. Microglia (100,000) were cultured on Matrigel-coated transwells, and invasion in response to buffer (open bar), 50 ng/mL CSF-1 (closed bar; +CSF1) or 10 nmol/L EGF (closed bar; +EGF) in the bottom well was measured. Transwells were fixed and stained with crystal violet, and the extent of migration was determined by counting the cells on the underside of the filter. Means ± SEM of data from three experiments. *P < 0.01 compared with buffer control. Next, we wanted to see if CSF-1R was playing a role in glioblastoma invasion in an animal model. Wild-type C57 mice were orthotopically injected with GL261 cells and fed with control chow or chow containing the PLX3397 compound. We confirmed by fluorescent in situ histochemistry on paraffin sections that CSF-1 was expressed in the tumor cells in vivo (Supplementary Figure 1). After 2 wks, tumors in the control group showed extensive microglia infiltration revealed by Iba1 staining (Figure 6). 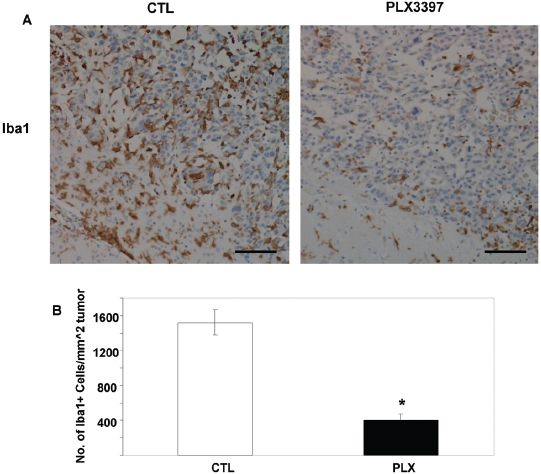 In animals fed PLX3397, however, there was a substantial reduction in the number of Iba1-positive cells at the tumor (see Figure 6). We next investigated the degree of GL261 invasion by staining with Ki67, a marker that was used to more clearly differentiate tumor cells from the parenchyma. As shown in Figure 7, GL261 tumors in control animals are highly invasive, displaying a diffuse infiltration into the parenchyma reminiscent of human glioblastoma (Figure 7A). Tumors in animals fed PLX3397, however, were significantly less invasive (Figures 7A, B). We observed many regions at the tumor-brain interface in the PLX3397-fed animals where the tumor border was clearly delineated, illustrating that the invasiveness of these tumors is strongly inhibited. These in vivo observations provide a compelling rationale for using anti-CSF-1R therapy in the treatment of high-grade gliomas. Blockade of CSF-1R in vivo inhibits microglia/macrophage recruitment to GL261 tumors. (A) GL261 cells (2 × 104) were intracranially injected into 8- to 12-wk-old C57BL/6 mice and allowed to recover for 24 h. Animals were then split into two groups: one fed control chow (CTL) and one fed with chow containing PLX3397. After 2 wks, animals were sacrificed and brains were fixed in formalin solution and paraffin embedded followed by immunohistochemistry staining using Iba1. Representative images were taken with a 10× objective. Scale bar = 100 µm. (B) The degree of microglia/macrophage infiltration in tumors isolated from animals fed with control chow (open bar) or PLX3397 chow (closed bar) was quantified by counting the number of Iba1+ cells per mm2 of tumor. Results shown are means ± SEM of data of at least eight tumors. *P < 0.001 compared with control. Blockade of CSF-1R inhibits glioblastoma invasion in vivo. 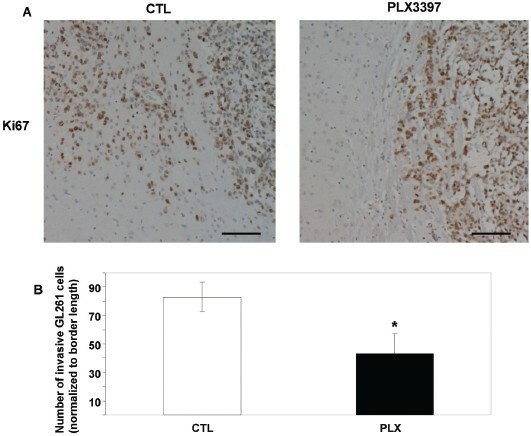 (A) C57Bl/6 mice were intracranially injected with GL261 cells and fed control (CTL) or PLX3397 chow as described in Figure 6. After paraffin embedding, sections were made and stained with Ki67, which was used to identify tumor cells. Representative images were taken with a 10× objective. Scale bar = 100 µm. (B) Invasion in tumors isolated from animals fed with control chow (open bar) or PLX3397 chow (closed bar) was quantified by counting the number of tumor cells that were beyond the border and normalized to the length of the border (in µm). Results shown are means ± SEM of data of six tumors. *P < 0.05 compared with control. The results from this study provide new insight into the mechanisms of glioblastoma invasion. Coculturing of glioblastoma cells with proportions of microglia similar to what has been observed in human patients results in a dramatic increase in glioblastoma invasion. Microglia-stimulated glioblastoma invasion was strongly inhibited by blockade of either EGFR or CSF-1R, implicating these receptors in mediating communication between these two cell types during invasion. We propose that the constitutive production of CSF-1 by glioblastoma cells can attract and stimulate microglia from the surrounding parenchyma. As microglia approach the glioblastoma cells in response to the CSF-1, microglia in turn stimulate glioblastoma cell invasion via, at least in part, EGFR activation. In some breast cancer models, EGFR and CSF-1R stimulate production of the other receptor’s ligands (7). In our studies, we find no evidence of stimulated secretion of the ligands by coculture or by stimulation with EGF or CSF-1. We conclude that production of CSF-1 by glioblastoma is necessary for the generation of interactions between microglia and glioblastoma cells that stimulate glioblastoma cell invasion. We observe that EGFR is necessary for microglia stimulation of glioblastoma invasion and that microglia express EGF. The most straightforward interpretation for these data is that microglia activate EGFR on glioblastoma. The EGF precursor is a membrane-spanning protein of a 150–180 kDa that is expressed on the plasma membrane in an orientation that allows cleavage and release of EGF (20). Because the precursor itself has EGF activity (21), the surface expression of EGF raises the possibility that microglia can activate EGFR signaling on glioblastoma cells in a juxtacrine fashion. Alternatively, it is possible that proteases required for EGF processing are present on glioblastoma cells and EGFR activation is triggered by EGF release only when glioblastoma and microglia cells are in close proximity. Any EGF released in this fashion might be rapidly taken up by EGFR on the glioblastoma surface and endocytosed. This result perhaps explains our inability to detect EGF in the supernatant of cocultures using ELISA (data not shown). Alternatively, other ligands for EGFR, such as heparin-binding (HB)-EGF or TGF-α, might be expressed by microglia and required for the stimulation of glioblastoma invasion through activation of EGFR. The expression of these additional EGFR ligands by microglia is currently being investigated. Finally, it is possible that microglia induce glioblastoma cells to activate EGFR by an autocrine mechanism. For example, proteases expressed on the surface of microglia may process EGFR ligand precursors on glioblastoma cells once the two cell types are in proximity. Several studies have observed an effect on GL261 tumor growth in vivo when macrophages/microglia were ablated using the CD11b-TK system (13,14). Although treatment with PLX3397 substantially reduces the number of microglia / macrophages associated with the tumor to a level that is similar to that of gancyclovir-treated tumors in CD11-TK mice (Figure 6), we did not observe any obvious difference in tumor size between control and PLX3397-treated animals. Thus, it is possible the microglia/macrophages that remain in the CD11-TK mice are also affected by the gancyclovir treatment and are unable to promote tumor growth. We also note that our investigation examines the effect of blocking CSF-1R signaling, which represents a more subtle treatment than eliminating these cells. Indeed, it is possible that blockade of CSF-1R signaling, while interfering with the ability of microglia to promote cell invasion into normal brain, has little or no effect on their support of tumor proliferation. Further studies will need to be carried out to elucidate the mechanisms of microglia-dependent invasion versus growth. Consistent with our observations, it has been reported that glioblastoma specimens from human patients express CSF-1 and that expression of CSF-1 correlates with the degree of glioblastoma progression (22). This study also demonstrated that CSF-1 expression correlated with the increased presence of macrophages bearing markers that are associated with the so-called “M2 phenotype,” which are believed to be one of the critical subpopulations of macrophages involved in tumor progression (6). In addition, a recent study used the Sleeping Beauty transposon mutagenesis technique in the brains of whole animals to screen for novel genes associated with glioma oncogenesis (23). It was discovered that >60% of the highgrade astrocytoma occurrence was a result of transposon-mediated enhanced expression of the Csf-1 gene. Using PLX3397, a small molecule inhibitor of CSF-1R that crosses the blood-brain barrier, we show that interfering with CSF-1R signaling in vivo prevents glioblastoma cells from invading into the parenchyma. Recent results from the Coussens laboratory show that inhibition of CSF-1R in a breast carcinoma animal model synergizes with paclitaxel in preventing metastasis and improving animal survival (22). It will be interesting to determine whether PLX3397 alone, or in combination with standard regimens currently used for treating glioblastoma, is able to extend survival of tumor-bearing animals. Clinical trials involving PLX3397 in treating glioblastoma, lymphoma, leukemia and breast carcinoma are currently underway or are in planning. Our results provide a mechanistic explanation for the involvement of CSF-1 in glioblastoma progression and indicate that inhibition of CSF-1R signaling could provide a novel approach to limiting glioblastoma invasion. ER Stanley is a consultant for Plexxikon on CSF-1/CSF-1R biology and a consultant for Amgen for therapies targeting the CSF-1R. BL West is an employee of Plexxikon. The study was funded by AACR-Amgen, Inc., Fellowship in Clinical/Translational Cancer Research (09-40-11 to SJ Coniglio); the Dana Foundation (SJ Coniglio, MH Symons and JE Segall), Association for International Cancer Research (AICR; SJ Coniglio and JE Segall), National Institutes of Health (PO1 CA 100324 to JE Segall and ER Stanley and P30 CA13330 and RO1 CA25604 to ER Stanley); and Voices Against Brain Cancer Foundation (MH Symons). We thank Carl Manthey for helpful discussions on the use of JnJ, AstraZeneca and Johnson & Johnson for reagents, Plexxikon for PLX3397 and PLX5562, and the Segall, Condeelis, Cox and Hodgson labs for helpful comments. JE Segall is the Betty and Sheldon Feinberg Senior Faculty Scholar in Cancer Research.